We get a lot of questions about herb gardening for beginners. The truth is that herb gardening is one of the most fulfilling types of gardening and also requires significantly less skill than the more exotic flowers. Herb gardening is not only a great place for the beginner gardener to start, but it is also a type of gardening that produces a result that is both fragrant and edible! While many beginner gardeners pooh-pooh the idea of growing something that is “all green,” what is seldom realized is how much they vary in flavor and fragrance. Read on to learn how to start an herb garden and herb garden tips. When growing herbs you need to decide how you are going to begin, whether you want to grow your herbs in small individual pots or whether you want to grow your own herb garden. Some people find that when they begin growing herbs it is easier to stay on track if they begin with small pots with a single plant in each. Growing herbs in pots for beginners is a great option! Many times this method is started with a small pot that contains a small dried tablet of soil with the herb seeds already contained within it. These small pots are an easy way to begin because all they require is a little water and sunlight to begin since the soil already contains much of the nutrition that the herbs need to grow. After growing herbs in this way for a little while; however, the plants will become too large for the small beginner pots and you will need to transplant the plants into larger pots to ensure that the roots have enough room to spread out without becoming tangled and choking the plant’s source of nutrition. Transplanting a plant from one pot to another is a relatively easy process; however, some people prefer to disturb their plants much less or grow larger amounts of herbs at a time and so they choose to begin an herb garden. Herb gardens involve more work in the first weeks of gardening since you need to prepare an area of the garden for your herbs and ensure that the soil contains the nutrients that are needed for the herbs to thrive. For the purpose of this article, we will assume that you will be planting an herb garden since this is the one method of the two that requires more instruction. Most people do not have a rich soil that is easy to manage and they can easily become discouraged before they even begin the gardening process when they try to turn over an area of soil and find a clay-rich soil or a sandy soil that does not look appropriate for planting anything. Herbs are a rather easy plant to grow which is what makes them a great choice for beginner gardeners; however, that does not mean that they will grow absolutely anywhere and that soil requires no preparation before planting an herb garden. All soil requires some type of preparatory work before anything is planted in it in order to assure that there is adequate nutrition and moisture. The first step is to test your soil to determine what type of soil you are working with. Most types of soil require the addition of a fertilizer to even out certain deficiencies within the soil composition, but before adding a fertilizer you must first determine what type of fertilizer to add and this is determined by the results of soil testing. Soil testing is a method used by gardeners worldwide to analyze soil to determine the elements and the amount of those elements within the gardening soil. Soil should be tested periodically and not just at the beginning of a gardening project. However, since the nutrient content of soil changes over time. If soil testing is not done before applying a fertilizer soil can easily be damaged and as a result, plants can be burned or may not grow at all. Soil testing is performed by your local county extension center as well as gardening companies and independent labs in your area. Some gardening centers and nurseries also offer soil testing services for a small fee. In order to give a comprehensive sample to the lab of your choice, you should take multiple samples from areas of your garden that you will be utilizing for your gardening experience. If the soil samples are from a relatively similar area and do not appear to be different combine a few samples in one clean container to present for testing to ensure that the overall soil quality his being assessed. If soil areas appear to have different types of soil all together it is important not to mix these soil types and instead present them to the testing facility in different sample containers. In order to get a good sample, you should take around 1 to 2 cups of soil to your testing facility for them to test. Make sure when taking samples that you do not take them from areas that have already been fertilized or from wet areas, soil should be dry why sampled. If you find that your soil is slightly moist allow it to dry naturally before taking the sample in for testing. Once received at the lab, specialists will be able to test your soil to determine which nutrients it has and which nutrients it needs in order to act as a fertile gardening soil that is conducive to gardening. It is important to provide information to the testing facility on what you wish to plant in the area at the time that you provide your sample, they may also wish to know how large the planting area is. Soil sample results will generally be timely and will provide information on what type of fertilizer you will need to apply to your planting area in order to make it a nutrient rich and well-balanced soil for planting your herb garden. In this five-minute video, Martha Stewart and Liz Taggart show the difference between healthy and unhealthy soil and how to bring life back to bad soil sustainability. Fertilizer is what helps to ensure that your soil is providing the nutrients that your plants will need in order to grow which is why it is important to apply the appropriate type of fertilizer to ensure that a plant does not receive too much of a certain nutrient. After applying the necessary fertilizer to your soil before planting your herbs you are creating a well-balanced environment for your plants to grow. But after your plant’s initial burst of growth tests may indicate that they have depleted certain nutrient levels in the soil and that another round of fertilization is needed. Many people ask which types of herbs are the best to begin growing an herb garden with but in reality, most varieties of herb are fairly easy to grow and the herbs that you choose to grow is really your preference. 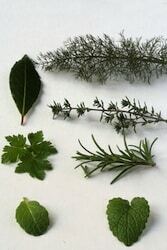 There is a wide variety of herbs to choose from with some having more fragrance and others being utilized more in certain types of cuisine so try to pick herbs that combine these two elements and create an herb garden that not only smells amazing but also produces herbs that you can utilize in the kitchen. There are a vast number of herbs that you can plant in your herb garden and the general requirement that needs to be taken into consideration for each is the amount of sunlight required by each. Some of the herbs that you may choose to grow in your herb garden include: basil, chives, dill, oregano, rosemary, tarragon, thyme, chervil, lemon balm, mint, parsley, cilantro, marjoram, chamomile and sage. Many of these fresh herbs can be located in your grocery store or organic food store if you are not sure whether you like the fragrance or taste of any of them so you can always do a little research prior to deciding which herbs you would like to grow in your garden. Basil is a pleasantly fragranced herb that many people choose to grow in their herb garden because it is frequently utilized in cooking and it is a strongly fragrant herb that adds to the smell of an herb garden. Basil flourishes when grown in full sunlight and takes around 30 to 60 days to mature at which time a plant should be around 10” tall. Borage is a light purple to blue colored flowering herb and adds both color and texture to any herb garden. The flowers and stems of borage have a light white fur on them which helps them to stand apart from other herbs. The flowers of borage are edible and have a variety of culinary applications from drink flavoring to salad toppings. In order to thrive, borage requires full sunlight and a good amount of heat. The flowers on borage open from spring until fall frost and attract butterflies. This annual herb is easy to grow and it is both drought-tolerant and resistant to deer making it perfect for any herb garden. Borage must be placed in full sunlight and grows between 1 to 3 feet high and ½ to 2 feet wide. Catnip is a fragrant herb but is not recommended for non cat-lovers because it is a major attraction to cats. This herb has larger leaves and adds diversity to any herb garden; however, it can quickly grow out of control. Catnip is easier to control if grown indoors in a pot but it can be controlled outdoors with a watchful eye. This herb is most popular among cat owners and is commonly sold in pet stores. Catnip can grow in both full and partial sunlight and attracts butterflies as well as cats. This is a drought tolerant herb that can also thrive in wet soil. Catnip blooms white flowers in the summer and grows to around 2 feet tall and 18 inches wide. Chamomile is an herb that most people recognize for its use in teas and aromatherapy products. The chamomile plant is known for producing small white daisy-like flowers that add a little color to herb gardens. Chamomile flourishes in full sun and takes around 120 days to mature at which point plants measure around 4” to 8” tall. Chervil is a more subtle herb and while it is used to add flavor its fragrance may be overpowered in the herb garden by some of the more fragrant herbs. Chervil is commonly utilized to flavor soups as well as cheese and fish dishes. Chervil flourishes when grown in full sunlight and takes approximately 120 days to mature at which time the plant measures around 20” tall. Chives are another herb that many people choose to grow due to the fact that they are so commonly utilized in everyday cooking. Chive leaves make a great quick addition to soups and bring a lot of flavor to basic salads. This herb requires full sunlight to grow and takes around 80 to 90 days to mature at which time the plant should be between 12” to 18” tall. Cilantro is a fragrant and flavorful herb that salsa lovers everywhere are familiar with and love to incorporate into their herb gardens! Cilantro requires full sunlight to bloom and can take between 60 to 90 days to mature at which point the plant should measure between 18” to 24” tall. at which point the plant should measure between 12” to 18” tall. Dill is an herb that some people like and others do not, it is frequently utilized for its seeds which are utilized to flavor pickles so if you grow your own cucumbers and want to begin pickling this is a good herb to grow. Dill requires full sunlight to bloom and takes between 40 to 60 days to mature at which time the plant should be between 12” to 24” tall. Fennel is a brushy green herb with a solid white base and it adds a lot of texture to a garden as well as draws in butterflies. This perennial herb flowers from late spring to early fall and prefers to be placed in the sun or in partial sunlight. Fennel grows to between 2 and 4 feet tall and can grow as wide as 15 to 18 inches. This is a fragrant herb that tends to attract a number of other insects in addition to butterflies which is why many people place it next to their favorite flowers in order to detract insects. Garlic chives are a popular herb among cooks as they bring a mild garlic flavor when used in culinary dishes. Garlic chives have beautiful but small white flowers that can self-sow at a rapid pace throughout the garden so it is important to keep an eye on this herb. This is a fragrant perennial which adds a little savory perfume to even the sweetest smelling herb garden. Garlic chives are known to attract butterflies and they are also resistant to deer. This is an easy to grow herb that is also drought tolerant but it does require full sunlight in order to thrive. Garlic chives will grow to around 2 feet tall and 2 feet wide and they bloom in the fall. Lavender is a beautiful addition to any herb garden because of its gorgeous lilac color as well as its pungent scent. Often used in cooking and in tea, lavender has a long-lasting fragrance and a number of health benefits including stress reduction! 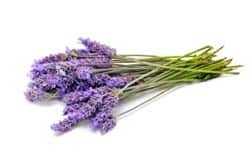 To meet their full potential, lavender plants should be placed in full sunlight. This perennial herb flowers in the early to mid-summer and attracts birds and butterflies while remaining resistant to deer. Lavender does not require a lot of water to thrive and provides a good amount of ground cover. Lavender plants can grow between 1 to 3 feet tall and between 1 and 3 feet wide. Lemon balm is a citrusy herb which many people choose to add to their herb garden due to its pleasant lemon flavor which is commonly used in tea. The fragrance of lemon balm can easily be overpowered by more fragrant herbs but the flavor is still pleasant. Lemon balm flourishes in full and partial sun and takes between 90 to 200 days to mature at which point the plant should measure around 24 inches tall. Lemongrass has the appearance of long grass and it adds texture and fragrance both to any herb garden. Thriving in warm weather lemongrass will thrive and add a gorgeous aroma to any garden. Lemongrass is a great cooking ingredient as well as a good addition to any number of herbal teas. The lemon scent of this slender herb will add a refreshing citrus scent to your herb garden. Lemongrass is easy to grow and thrives in both full and partial sunlight. This is a perennial herb and can grow to between 3 and 6 feet tall and between 5 and 8 feet wide. Many chefs choose to grow lemongrass indoors when they use it frequently in cooking, since it does not thrive in colder seasons. Lemon Verbena has long and slender leaves that add variety to even the greenest of herb gardens. Fragrant and delicious lemon verbena has many culinary uses from baking to herbal teas. This is another deer resistant herb that blooms in the late summer for early fall flowers. Lemon verbena is easy to grow and requires either full or partial sunlight to thrive. When fully grown this herb stands around 6 feet tall and can be as wide as 6 feet as well. Marjoram is a sweet herb that many beginner herb gardeners have not thought of adding to their herb garden; however, it is a flavorful herb that brings a lot to a variety of different cuisines. Marjoram flourishes in full sunlight and takes between 60 to 90 days to mature at which point the plant should measure 12” tall. Mint is generally the first herb of choice when it comes to growing an herb garden because it is the most commonly known herb and has a particularly pleasant aroma and flavor to it. Mint can be utilized in a variety of dishes as well as fragrant drinks and aromatherapy products. Mint flourishes in partial to full sunlight and takes around 90 to 200 days to mature at which point the plant measures between 18” to 24” tall. Parsley is a popular herb due to its many applications in various cuisines. Parsley is incorporated into a vast number of dishes including cooking meats, making salad dressings, making soups and making pesto! While parsley does not have a particularly strong fragrance to it, it does have a unique taste which enhances all of these dishes. Parsley blooms in full to partial sunlight and takes around 40 to 60 days to mature at which point the plant should measure between 12” to 18” tall. Oregano is one of the more commonly known herbs and many first-time herb gardeners choose to grow it due to its pleasant fragrance as well as its application in cooking. Oregano makes a great addition to many Italian dishes so if Italian is a cuisine of choice in your household this would be a good herb to add to the herb garden! Oregano blooms in full sunlight and takes between 90 to 200 days to mature at which time the plant should be between 12” to 24” tall. Rosemary is an herb that many people utilize in cooking to flavor both vegetables and meats as well as in aromatherapy products. Rosemary can be a particularly fragrant herb as well which is why it is commonly used in aromatherapy. For those who don’t care for the scent or taste, this may not be the herb for you! Rosemary blooms in the full sun and takes between 90 to 400 days to mature at which time the plant should measure between 24” to 36” tall. Spanish Tarragon is one of the more popular types of tarragon that herb gardeners choose to grow based on its licorice-like smell that permeates the garden. The flower of the Spanish tarragon plant is also frequently utilized to bring a little color to an herb garden due to the bright yellow Marigold type flowers. The Spanish tarragon plant blooms in the full sun and when fully grown they may reach up to 12” high and 18” wide. Thyme is one of the basic herbs that most people recognize and many beginner herb gardeners choose to incorporate into their herb garden. Thyme grows low and gives a little height difference to an herb garden but it also brings a lovely aroma. This is a commonly used herb in cooking which is another reason that many people choose to utilize it in their herb garden, so that they have fresh thyme on hand when they need it. Thyme flourishes in full sunlight and takes around 180 to 200 days to mature at which time it should measure between 6” to 12” tall. Sage is another of the basic herbs that many people are familiar with. Sage adds a pleasant aroma to an herb garden and has a variety of applications in numerous cuisines. Sage flourishes in the full sun and takes between 90 to 200 days to mature at which point the plant should measure between 12” to 24” tall. Salvia is a beautifully dark violet annual herb that adds a splash of color to any herb garden. Salvia is particularly hardy and can thrive in dry and damp climates. This beautifully colored herb is particularly attractive to hummingbirds and butterflies. Salvia is easy to grow but they do not thrive in colder climates so they should not be planted until warmer weather is approaching. This herb requires full or partial sunlight in order to thrive. Salvia can grow to between 1 and 3 feet tall and approximately 1 foot wide. Stevia is a particularly popular herb these days as it has become a common alternative to artificial sweeteners and sugar. This sweet herb is a tropical plant and as such it requires soil that does not hold on to water creating damp climates. Stevia also does not thrive in colder climates but it does grow well indoors so when frosts move in it should be brought inside the home. This herb blooms in the summer and fall and can be used in a wide variety of culinary methods. The beautiful white flowers on the stevia plant add a great contrast to some of the darker flowering herbs. Stevia is an easy herb to grow and prefers full sunlight. The average height of a stevia plant is around 30 inches and the average width is around 18 inches. Deciding to create an herb garden is a project that will take your time and energy but will also reward you with flavorful fresh herbs to season your cooking as you please. Of all of the varieties of things that you can choose to begin your gardening career with, herbs are by far one of the simplest, yet most rewarding plants to try your hand at. Just remember, gardening is a process that requires love and attention and in the end, you will always be rewarded with the fruits of your labor. Need a coupon for your gardening materials? We have some limited time sensitive coupons for our readers. Check out the comment section below for details and the coupon codes. Starting an herb garden is easier than you think! Have you tried to create a herb garden? Were any of our tips useful? Please share your experience with our community members below. Any feedback you have on our article is welcome as well! What do you grow (or want to grow) in your herb garden? For a limited time (expires 12/31/12), take advantage of the gardening resources on GardenersHub.com and use the coupon code “EARTHSFRIENDS10” at checkout for 10% off your entire purchase! While soil is important, make sure that your herb garden is also very well-drained. A poorly drained herb garden will soak the roots and quickly kill your plants. So don’t compact your soil and use a sandy bed if necessary. You can also take care of this problem when growing plants in pots by making sure you only use pots that have holes in them and being careful to never overwater. You should also keep in mind that some plants are easy to transplant and some will resist it will all of their heart. For example, dill is difficult to transplant but easy to start from the seed. Chives, on the other hand can be cut and transplanted to spread out your crop every year. Marjoram and similar herbs fall somewhere in the middle: they can be transplanted, but the entire plant must be moved and they do best when they are grown by the seed indoors for a while and then carefully moved outdoors. Some herbs, like rosemary, are grown primarily from cuttings simply because it takes a long time to grow a plant up from a seed and people tend to get impatient. While it is unpleasant to think about, your plants may not be safe outdoors from wild animals. While some herbs are unpleasant to some animals because of strong smell and taste, there is typically some species everywhere that is willing to eat anything. Deer, for example, may feel like grousing around your new shoots. Chipmunks and rabbits alike may try to sample your herbs as they grow. If these animals do not like your food, they may choose to uproot their sample rather than just leave it alone. Birds also may be unintentionally destructive. Even cats may be tempted to gnaw on some of your herbs. If you already have a flower garden or have tried to grow in the past, you probably know what types of animals to expect. If not, then try to put your garden somewhere out of reach or cover it with netting, fencing, or other protective materials. When in doubt, don’t be afraid to make your herb garden an indoor project. Window space is not necessarily required even for sun-loving herbs. There is a wide variety of grow lights on the marker, and while many of them are used for less legal types of herbs, they can still do an excellent job of supplying the right wavelengths for a miniature indoor herbarium. Some kits even come with a light, timer, and growing station all packaged together. This is an ideal option if you live in an apartment building or do not have the space in your yard, too. Because herbs tend to stay small and can be easily harvested for meals, deciding to keep your garden indoors may be a good choice. If your live in a rough climate, you may find that growing indoors changes some annual herbs into perennials, since they can now survive freezing winters inside. I recently just bought an herb gardening starter kit for my sister on her recent birthday. She is actually a very educated biologist and a bit of a foodie that has made a strong emphasis on eating more healthy in the past several years. All of those facts together made me think that a small set of potting plants with some herb seeds would be a perfect gift for her and she loved it. She has not potted the seeds just yet but now that I have found this article I will definitely forward it along to her. In my own experience, the only trick of growing any kind of plant domestically is making sure to find the best mixture of sunlight exposure and watering and stick to it religiously. I have made the mistake of overwatering plants and under exposing them to sunlight, and the results were not good. I more or less have just figured this out through trial and error, but an article like this could help a great deal. Thanks for writing it! I think an herb garden is one of the best ways to introduce kids to the world of gardening. They are so easy to grow and can be used for so many different things that a parent can use one without worrying about the child experiencing failure. It also provides the perfect preface to teaching children about good nutrition and cooking. Kids who grow their own herb garden are going to want to take the next natural step, which would be to actually make use of their herb garden. They can do lots of things with their herbs, and my even want to start cooking with them. I only know this because I have a teenage daughter who has no interest at all in cooking until she grew her own herb garden. Then she wanted to know what each herb was good for and how it tasted. Eventually, she started using her herbs in cooking. That is something I never thought I would see, but it just goes to show how one positive activity can lead to another. Now I can hardly keep her out of the kitchen. She has made some interesting dishes so far and I look forward to what she may do with her herb garden next. When I did my first herb garden, I got a little carried away because it was so easy to do and there were so many benefits. You can’t really go wrong by growing plants, but if you are anything like me, you like to put what you grow to a practical use, whether it is for taste or medicinal or whatever it may be. I made the mistake of growing too many varieties of herbs and found that I would gave been better off just starting with the herbs that I commonly use. It was nice to have all the plants, but since I was not familiar with all of them, I did not use them like I should have. I also ran out of the ones I commonly use. My suggestion is to go into your spice cabinet or rack and make a list of what you have in there. If you actually use the herbs that you find in there, you can start by growing those. This way you can learn how to tend your herb garden and know it won’t go to waste. As you get more comfortable, start adding more herbs to the garden. I would say to maybe add one or two at a time as you experiment with new recipes and so on. As someone interested in starting their own garden, you have lots of choices about which direction to take. You could choose to grow flowers or vegetables, or specialty plants or even herbs. Given all of these choices, the best for a beginner may just be to start a herb garden. Flowers and plants can be very complicated, difficult and time consuming. On the other hand, with just a little bit of basic knowledge (which this article can give you!) you can be up and running in no time. A great advantage of growing herbs is that they grow fast! Certain herbs can grow and be picked 2 or even 3 times a year. Compare that to flowers which typically require a whole year for you to really see the fruits of your labors. I certainly love instant gratification! This article really provides a lot of great pointers for the beginning herbalist (for lack of a better word). The basic steps are all included, like where you will grow the herbs (individual pots or in a dedicated garden), how to test and prepare your soil (very important) and more. One of the best and easiest types of gardens to grow is a herb garden. This is a great place to start for an absolute beginner, since it requires just a little bit of effort and the herbs grow very quick. This means that you will be able to see the results of your efforts quite fast. This alone beats vegetable and flower gardens; I am too impatient to wait a whole year to see if what I did actually worked! The first step is to really decide how to begin. This means determining whether you will grow the herbs in individual pots or in a whole garden. This really depends on how much space you have and your own personal preferences. The next step is to have your soil tested. This is very important since many parts of the country will be lacking in at least one of the vital nutrients that herbs need to grow. This will also determine if you need to add anything to the soil. Then, pick which types of herbs you want to grow. I made a decision to buy a friend of mine an herb garden for their birthday as they really do cook a lot and have a sharp eye for all things “green”. When I went out on to the web to look for a good starter kit, I was almost overwhelmed with the options I had before me. Trying to select the right one was a little challenging but ultimately, I just had to think about a couple things that lead me in the right direction. Number one was what kind of herbs is the person most likely to use. In the case of my friend, I knew they used basil in a lot of their dishes and if I was able to provide them with the additional motivation to grow the plants by wanting to use them, it would be that much more of a success. Number two, was the ease of which the plant would grow. Herbs are generally more simple to grow than other flowers and plants, but there are still degrees of difficulty that must be considered. I love the way they are marketing herb gardens now. They sell these little packets so that everything you need to start an herb garden is right there for you. They are really easy to use and are a great way to get someone started who does not have anything to start with. Most of the time, I end up stopping projects because I don’t have everything I need and I hate it when they happens. So the idea of an herb garden package that has it all is just mind blowing for me. The other thing is that since you can use our herbs for cooking, it is really easy to impress people with your potential cooking skills. After all, if you are growing your own herbs, you must know how to use them, right? That may not be true, but apparently people think it is so they are prepared for an awesome meal. Even if you just know how to cook a little bit, the mind matters. People will think you’re awesome even if you really aren’t. I found that one out on accident the last time I had guests over. The only problem was that the dish I was making didn’t involve any of the herbs I grew so I had to kind of wing it. Hey, guys, thank you so much for this article. What a complete and thorough handling of the subject matter! I actually suffer from a purple thumb right now. I am very good with domestic things however; I just really do not try when it comes to plants. I have always lived with other people and never really had my own space. Now that I know that I will have my own space soon, I am planning to get into gardening. I love cooking and having fresh herbs is something I have always dreamed of. I was also planning to get some of those upside down tomato and berry plants too. I am looking forward to growing several things for both personal and family consumption, so this article is a great resource. After reading through it, I actually feel like I have the confidence to start a healthy garden. I always felt like I could do well with gardening if I tried, but I’ve never been motivated. Sometimes when you live with controlling people, it just takes all the wind out of your sails. It definitely makes you feel less creative and less motivated. This is such a wonderful resource. When I was growing up, I planted chives and dill with much success. In fact, when I moved out on my own, I was shocked that these fresh herbs cost so much in grocery stores because they were so easy to grow. I don’t have a lot of time to work in a garden anymore, but would love start an herb container garden. I’ve looked at many kits, but they usually contain herbs that I know I won’t use. I think the best option for me is to purchase a couple window containers so that I can plant exactly what I need. I think fresh herbs are one of the best things you can grow to encourage healthier eating. Being able to season dishes with fresh chives or rosemary gives you excellent flavor without the need for high-sodium seasonings or butter. If you’ve never cooked with fresh herbs though, you must remember to be more generous with your seasonings. Dried herbs are concentrated in flavor, which means you need a lot less. You can find charts online that will tell you how much dried herbs equals fresh herbs, which makes it easier to convert your recipes to use fresh herbs. When you decide to move you’re herb garden outside into the real soil, be very careful that you choose the right location. Yes, many herbs do like lots of sunlight, and this is a very important factor when raising the sprigs inside when first encouraging them to become strong enough for transplanting. However, there is sunlight and there is sunlight. For experienced gardeners this is an automatic consideration, but if this is your first time trying to grow herbs, be very careful choosing a location. The general rule says six hours of daylight at a minimum. This means that many herbs will need even more daylight, which makes it difficult to utilize all those tiny pockets or corners where an herb garden would be so perfect. A window box or a bed in open ground where sunlight is frequent may be best if all the areas against your house receive too much shadow. However, even more important than this shadow factor is the type of climate that you live in. Many climates will support herbs…in the mild parts of the United States. Other locations will not be so friendly. Herbs tend to suffer in hot, dry conditions. You may get some naturals like sage to appreciate a desert condition such as that spreading across most of Arizona, but basil will not last more than a few weeks even with the most careful protection. Herbs simply cannot survive that sweltering heat, they are largely not designed for it. So if you live in an arid region, keep the herb indoors and next to windows rather than trying to transplant them outside. If you live high in the mountains, take equal care. Often the summers are too hot and the winters are too cold for herbs to survive very long outside. You may be able to encourage a brief crop in late spring and early summer if the herbs are hardy enough, but do not aim for more than that. Herbs such as parsley love wetter climates, but if you live in an area that receives a lot of cloudy weather, you may not have enough sunlight for other types of herbs. Likewise, living on the seashore is rarely conducive to growing herbs, since the salty water transmitted by wind and air will be too much for many varieties. Also, as your herbs continue to grow well, keep cutting them and using them in cooking. Number one, this is why you should be growing herbs in the first place! And number two, continual cutting your herbs during growing season will encourage them to continue growing. When you cut your herbs, wrap them in a damp paper towel and store them in the refrigerator to keep them fresh. If you have any doubts about what herbs may grow in your climate, take a trip to a local nursery and see what they have growing there. Even if the plants don’t tell you much, the store owner will give you good advice. I love the idea of having my own herb garden and this article has inspired me to look into it further. I currently live in an apartment in the city, so having a full out garden seems a little unlikely in the very near future. However, I do grow several plants here on my sun porch including a long series of vines that are currently wrapping themselves around my windows as we speak. They are all very beautiful, if not simple, and it is highly enjoyable to see them grow and to know that it is how you take care of them that makes them that way. I have learned a lot by doing this and I would like to share a bit of that now. One of the most basic things to do to keep a plant alive is to water it. However, there is definitely such a thing as over-watering a plant. I gave a potted flower to my girlfriend once, I forget what it was, but it was potted in small rocks rather than soil. She watered it about three times the first week and it promptly wilted over and died. Lesson learned, do not water a plant until you know that it needs it. You can do that by either researching what a plant typically needs, or by keeping tabs on how the plant looks and how moist the soil may be. A few times a week, I will usually stick a fingertip into the soil of my plants, just a little bit below the surface and feel how much moisture is still trapped inside and against the roots. Based on what I feel, I will either water accordingly or let the plant be for a little while. The other, and really only other, thing I can think to tell you about keeping plants alive is to make sure they are in the right place in your house. Plants need sunlight on a regular basis in order to grow and be healthy. However, just as water is a good thing but not in unlimited quantities, so too is sunlight. Plants need sunlight in order to photosynthesize light into food and without it they will die in pretty short order. If they get too much, they can dry out too quickly and die as well. A place that has some shade and also some good exposure to natural light will give a plant the opportunity to find its own best position. Leaves and branches will naturally crane themselves into position to get the best amount of sunlight to sustain their growth. My vines are really fascinating as they move themselves around my sun room getting themselves situated. I believe in a more naturalistic approach to raising my plants and I would suspect that doing so with an entire garden would produce good results as well. I am really looking forward to giving it a try. One of the best ways to get started with gardening is by growing herbs. The author also correctly points out that this is one of the (if not the) easiest ways to get started. This is actually how I started out; you certainly do not need to have a green thumb in order to do this. It is also a very rewarding pastime, since you will actually be able to use what you grow as seasonings for your food. You will definitely appreciate the taste impact that fresh herbs will have on your food! To begin with an herb garden, you do need to take some planning steps before digging and dropping seeds. The first step is to decide whether to begin with individual pots (a single herb per pot) or to actually create a full garden. Then, decide where to place the pots (or garden). As the author correctly points out, how you begin really depends more on your personality and situation; both methods are equally easy, although they do present different challenges and opportunities. Also, do not forget to test your soil for the proper minerals. One of the things that I have always wanted to do is grow a nice little garden. Honestly, I have all of the space needed and also think my soil would be good enough to do so. However, for some reason I have just never actually started to put this project together. As I saw this article, I started thinking about why not. It also occurred to me that there must be others who are in the same position. This article was an eye opener for me. I think that possibly the idea of actually starting to grow vegetables or even flowers may have been too ambitious a project for me. The author points out the fact that maybe taking a step back and then considering an herb garden would be an easier goal. Perfect! I also really enjoyed the explanation of the various types of herbs which can be grown in such a garden. There are also a number of excellent tips and ideas for how to be successful with such a garden. For example, when combining various herbs in the garden, be sure to place them strategically. I live in northern Indiana. When the weather is normal, we spend quite a few months in the snow and cold weather that doesn’t allow for an herb garden to be grown outside all year long. I know that you can dry herbs for later use, but I feel like they lose some of the flavor and medicinal benefits when you do this. I’m trying to figure out a way to have an herb garden in the house all year round. One of the issues with that is the fact that I have cats. I don’t even want to think about how many seeds I’ve started in the house, just to have them knocked off the window sill by cats who just want to play in the dirt. So, my solution is going to be to create a sort of greenhouse in my window. I don’t like the garden windows because they seem very small to me compared to the amount of plants I would like to raise. I don’t want just one small plant or two. I want to have about ten plants that can produce enough to serve my cooking and basic medicinal needs all year round. So, I’m going to get some of the trim they use for shelving to try to keep the plants out of the indoor window box I hope to create. I also plan to plant a few plants that my cats don’t like to keep them from even being tempted to get into my herbs. Wish me luck on my project and thanks for the advice on the various herbs! I really enjoy growing plant, but I enjoy it more if the plant serves a purpose other than just being attractive. I mean, I know all plants help improve the quality of the air, but I like plants that are even ore useful than that. Herbs are especially great because they can be medicinal, add flavor to a dish, change the flavor of a dish, or just fill the kitchen with a pleasant odor. I live in the north and we sometimes have long cold seasons. My kitchen is only so big, so I can’t really raise anything in it but an herb garden. In the winter, I start feeling edgy and cooped up. I would rather be outside working in the yard on a hot day than stuck in the house with no plants to tend on a cold day. So for me, an herb garden offers numerous benefits. One thing that people have to remember if they are going to raise medicinal herbs is that herbs can have some powerful side effects and may interact poorly with medication. You can’t just raise plants in your kitchen and use them without much thought. You have to be responsible and educate yourself or you will end up putting yourself and loved ones in danger. 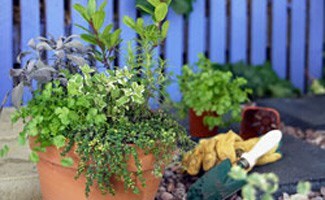 I think those little herb pot kits are a great way to go for someone who is just starting their herb garden. They are not very expensive and they do not take up a lot of room, so you might even be able to fit them on your window sill. Just make sure to put something under them because if you are anything like me, you are bound to spill some water when you water them and you don’t want to cause any damage to your home in your efforts to grown and herb garden. You also need to make sure your herbs are out of reach of your animals. Some animals might try to taste them. I am not sure which herbs are dangerous to animals, but it seems like I heard that there were a few that were dangerous to cats. I have a tray I put my plants on. It’s bigger than the window sill and hangs over a bit, so I put two nails in the wall to hold it level so the animals can’t knock it over. I just have seeds in there now and I will do more research before the plants get too big so I can keep my animals safe, but I am very much looking forward to enjoying my plants in the window. In my opinion, an herb garden is the best kind of garden for someone who is just starting out in the gardening area. They are not expensive to start, so that takes part of the burden off. They do not require a large area unless you plan to dry a lot of your herbs. For some, I know space is a big concern. People who live in apartments or have small yards should not have to suffer just because they do not have a lot of room to garden in. Any kitchen window will do for a small herb garden. Of course, once you start using your own herbs, you are probably going to want to grow your own food to use the herbs with. But, once you have an herb garden, you at least know that you can grow something that you can use in your own kitchen. Doing something like starting a vegetable garden would be the next logical step. And of course there is the benefit of being able to reuse your plants like you can’t do right away with vegetables. When it comes to herbs, you can just pick a few leaves and let the plant continue to do its thing. Many people who have always dreamed about starting a garden may have just given themselves too ambitious a goal. Instead of trying to grow flowers or vegetables, start by doing something which is easy, simple and still very rewarding and enjoyable. The author makes a great case for starting off with a nice herb garden. The most important first step, after deciding where your garden will be, is to take some soil samples and have them tested. The reason this is important is that many times the soil is lacking some important minerals or other ingredient. Not having this could cause your garden to have big problems. Knowing the conditions ahead of time can allow you to get the proper supplementation to make your soil healthy and ready to grow all your herbs. Take soil samples from different areas within your garden in order to get a good overall feel for the conditions. You may be able to find a soil testing lab in your area, but if not, then go to a garden store. Having a garden can be an excellent and rewarding pastime. However, for those of us who have never grown anything before, a herb garden may be a good place to start. Many herbs are easy to grow and the grow fairly quickly. You will not only see the results of efforts very soon, but also be able to use them in cooking. Basil is one of the most commonly grown herbs. This guy grows best in direct sunlight and takes around 30 to 60 days to fully mature. The author indicates that such a plant should be around 10 inches tall at this point. Chives are also a nice addition to a herb garden. They are also very useful since it can be used in a number of dishes as well. This one also requires direct and full sunlight. It should take between 80 and 90 days to mature and be ready for harvesting. Twelve to eighteen inches tall is a normal size for this plant. Of course, there are a number of additional options; these are just a few to consider.